These are the greatest of brewers in Nordgaard, and their recipes are in fact encoded magical formulas and ceremonies; a fact which elevates the Brewers of Odrorir from tradesmen to minor elemental mages. The enchanted formulas bind elemental Earth power into the drafts, endowing each with enchanted effects which work upon the drinker. 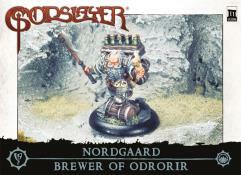 The Brewer is therefore a support character for the warriors of the warband. His Hardneck Mead makes the drinkers oblivious to pain, allowing them to fight on after receiving normally fatal wounds. Strongarm Ale renders drinkers more violent but less cautious, so that they make fast and wild swings with their weapons, (providing +1 MEL and POW but -1 DEF). Guarding Draft endows the drinker with the fortifying elemental power of the Earth element. For greatest effect, use him to boost the highest-point-cost unit in the Warband and the Warlord. This metal miniature has a height of 28mm (head to toe), consists of several parts, and comes unassembled and unpainted.